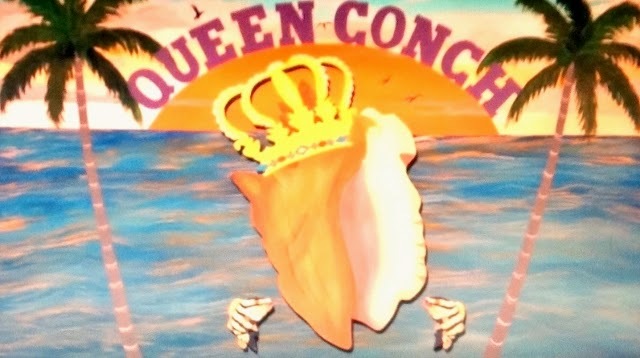 There are six types of conch in the Caribbean - with the Queen being the largest. Queen Conch is the only type eaten in the Bahamas, and it's estimated that over a half million pounds are consumed each year! 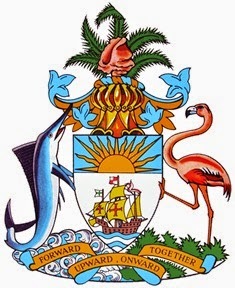 The Queen Conch is prominently displayed on the country’s coat of arms, and was illustrated on the very first Bahamian postage stamp issued back in the mid 1800's. This cultural icon is found on the menu at every type of restaurant from beach bar shacks, family owned dining establishments, and the finest restaurants. Conch is basically a large sea snail encased in a hard spiral shell with a shiny pink or orange interior. The spelling can be misleading - the correct pronunciation is with a "K" like Konk! Preparing Conch - Cleaning and preparing conch is an art! From the sidelines it appears to be a rather easy job to separate the conch from its shell. Make no mistake, this is an art form that has been perfected, and Bahamiams pride themselves in how fast they can crack, jook and slop the conch. Fishermen and vendors go out before dawn to catch the slow moving conch which are normally found on the bottom in waters less than 25 feet deep. It takes approximately 30 conch to make 50 servings of conch salad. Fresh Conch Salad sells for $6.00 a cup, and it's one of the most nutritious and affordable meals on the Bahamian menu. With millions of conch eaten locally, it's not difficult to find a conch shell - they are everywhere! The hard spiral shaped shells have blunt spikes, and the lining of the shell has a unique pink, yellow or peach mother of pearl color. The shells are cleaned with bleach or muriatic acid - and often they are left to bleach out in the sun. Locally the shells are used as musical instruments in island carnivals and traditional ceremonies, landscaping and home decorations, and they make excellent decorative planters. For the tourist market, the shells are made into jewelry, art and a wide variety of other sourvenirs. But in the Bahamas, you can have it your way - Choose from raw, deep fried, steamed, stewed, grilled, conch chowder, conch lasagna or fettucini alfredo. Perhaps a scorch conch, where the flesh is scored prior to chopping, and then there's even spicy Conch Chili. Raw conch can be compared in color to lobster as it has firm white flesh with a tinge of pink. While the texture is firm and chewy, the taste is mild and sweet. Actually it's the foot muscle of the conch that has the sweetest white meat. 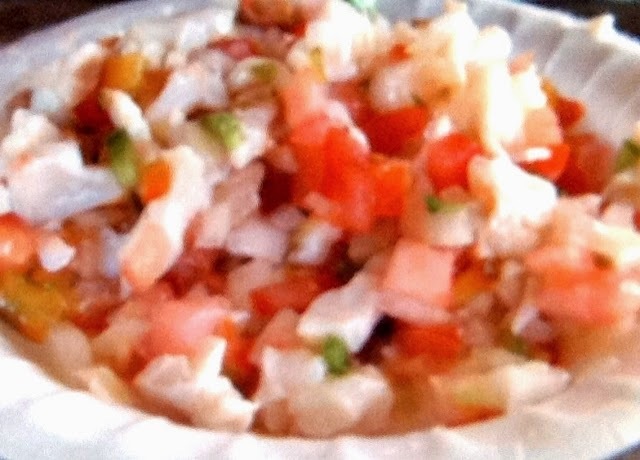 Conch salad is made from the raw chopped meat, and chopped celery, green pepper, tomatoes, and onion are all mixed together with salt and pepper. Then fresh lime and orange juice is poured over the mixture - and a little hot pepper sauce adds a good kick. I always get an extra order for the next day, and find that marinating overnight in the refrig makes the taste even better. Highly Addictive!! “Cracked”, or battered and deep-fried conch (pictured) tastes similar to fried calamari or fried clam strips, although it is far more tender. Grilled Conch is prepared on the grill with plantain, butter and garlic. The same ingredients in conch salad are normally used for the grill. Conch Chowder is thick, creamy and quite filling, and it's normally served with Johnny Cakes. Have not tried the steamed or stewed conch, however I am told both techniques really bring out the flavor. It takes 3-5 years for an adult conch to reach maturity, and the shell can be up to 12 inches in length, and weight up to five pounds. Due to local and export demand the conch has been harvested harvested before having a chance to reproduce. Conch like to breed in large numbers, so if the numbers fall below a certain level, they will not reproduce. In many parts of the Bahamas the numbers of conch have disappeared, and conservationists have urged the government to end conch exports. The U.S. imports approximately 600,000 tons a year from the Bahamas after the commercials conch fisheries in Florida collapsed several decades ago. After being put on the Endangered Species list, hopefully the population will continue to be harvested at a rate consistent with the its population growth. So pay homage to the Queen on your next visit to the islands of the Bahamas - she is quite tasty!